Thank you all for your warm wishes for Gorgeous Girl, she is well and truly on the mend now and has been keeping down her feeds. She is back to the usual puddle of drool that seems to be par for the course these days. Since there has been a dearth lately of crafty content on what is ostensibly a craft blog, I thought you might like to see a few of the things currently on the needle(s). 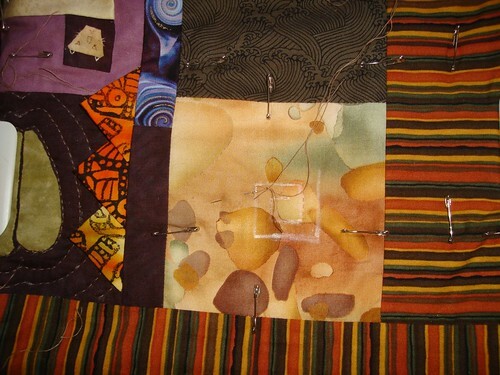 Last night I finished quilting another block for the African Animal quilt and began a new one. Gorgeous Girl is currently sleeping and I’m hoping to put in some quality time with this once this post is finished. On Monday I began a crocheted sun hat in this brilliant yarn from The Secret Knitter. The orange isn’t actually that bright in real life. See the background? It’s a box. My mum and brother gave me the box as a thank you for having them stay. It’s currently living in the living room at the side of the couch and is housing my WIPs. 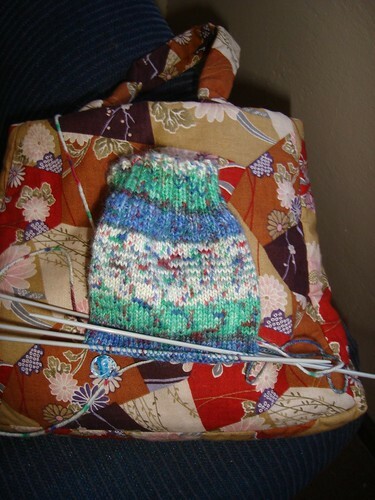 Also on the needles is Mum’s sock in the pfau (peacock) yarn by Opal that she chose while she was here. I made the bag in the background too. Also on the needles, but having made no significant progress since the last time they were shown on the blog is the cardigan for charity and tiger socks for me. After spending quality time with the quilt I’m hoping to get into the sewing room to sew some bibs from the pattern in my Christmas present, provided of course that Gorgeous Girl stays asleep. I start back at work on Tuesday I’m teaching one class, so that’s only 5 hours a week. We are hoping to coordinate our timetables so that Gorgeous Man can watch the child when I’m teaching. The extra money will be nice and it’s only an hour a day. Hopefully it won’t eat into the crafting time too much; by the time I’ve packed up Gorgeous Girl, dropped her off with Gorgeous Man, taught the class, picked her up and walked home it’s about 2 hours total. Hmm, notice there was no mention of housework there lol. One good thing about the work is that I have to walk up and down a steep hill every day, very good for the figure. 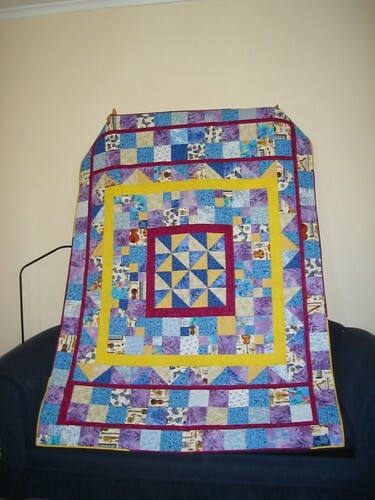 Ok, enough rambling, off to hang the washing on the line – it’s a lovely day today in Cape Town, but stinking hot, and do some quilting. Have a great day and if you’re a visitor who doesn’t comment (I won’t use the ‘L’ word) feel free to introduce yourself. Well Gorgeous Man and I racked up another parenting first last night (or should I say this morning): the midnight run to the Emergency room. Gorgeous Girl started vomiting late last night. When it got to the point that she was extremely lethargic and vomiting on an empty stomach we decided to take her in and get her looked at. The doctor thinks she has a virus – there’s certainly one going around; the ER was full of vomiting children and one toddler was carried off to the children’s ward with an IV in his arm while we were there. The good news is that Gorgeous Girl was not ill enough to need further treatment from them. I’m very grateful to the doctor who respectfully treated us as good concerned parents, rather than as over-anxious first time parents. I spent today trying to get Gorgeous Girl to drink rehydrating fluid from a bottle, after I was spectacularly vomited all over following her morning feed. The virus seems to have run its course and she has managed to keep some milk down this evening and is currently sleeping. There was minimal stitching done today. I’m doing some consulting work tomorrow (and I’m getting paid for it yah!!) 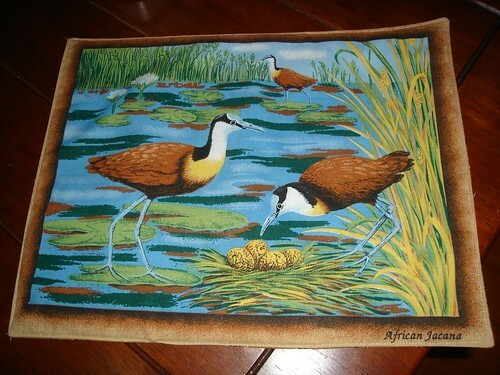 but hopefully that won’t take too long and I can put some more stitches into the African Animal quilt. That really suffered while Mum and my brother were here. I’m keen to get this one finished so that I can start on the kit that my mum delivered for me when she came over – I refused to trust South African post with that one. If you’ve only been reading for a short time you may not realise that I’m an odd type of quilter that only works on one quilt at a time (means I have no UFOs though). 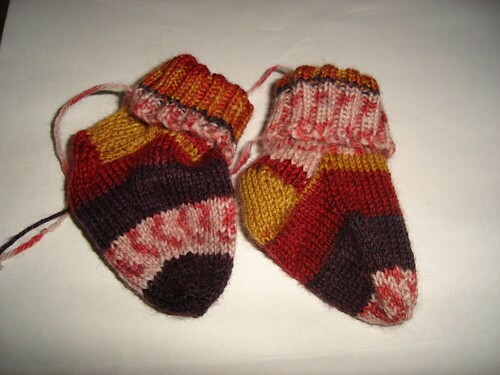 Mum’s sock is coming along nicely. I knitted frantically on it in the car coming home from the airport (distraction knitting) and I grabbed it as we were heading out the door last night and spent half an hour knitting on it while we waited to be seen by the doctor. We put my mum and my brother on the plane this morning. It was very hard to say good-bye. I have my sewing room back, but the house is strangely quiet. Here’s Mum enjoying some quality time with Gorgeous Girl. Mum did not go home empty-handed. I made sure that she went home with lots of crafty goodness. 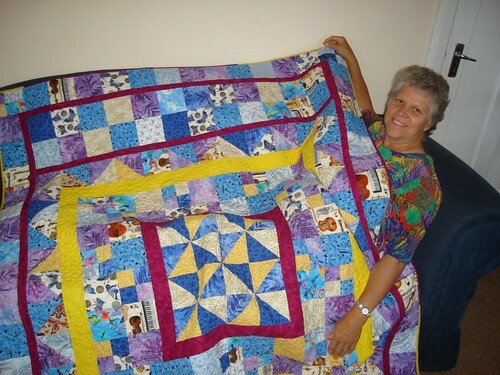 In addition to the Bible cover, I delivered her quilt that I finished last year. I told her I wasn’t going to trust it to the post office and that she would have to come and collect it in person. She’s thrilled with it, can you tell? I also made Mum a set of placemats. But only managed to photograph this one as she had already packed the rest. 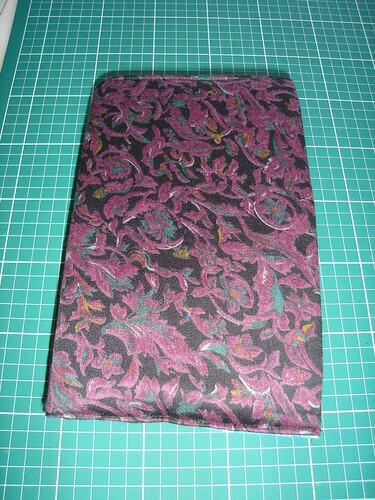 I think I’m going to have to buy some of this material for Gorgeous Man and I.
I also measured Mum’s foot and cast on a pair of socks for her, but simply ran out of time and they will have to be posted. Ironically, Mum’s Christmas parcel still hasn’t arrived and she has been and gone. I’m beginning to think that it’s suffered the same fate as the Christmas 2005 parcel from her which had some of the Christmas presents stolen out of it by South Africa Post. I maybe wrong, but it’s looking like some postal worker is enjoying Gorgeous Girl’s Christmas gifts. My knees are still very sore and I’m finding it difficult to walk for a long period of time. Now that the tourists have gone home I’m able to rest them a bit more, so that should aid the healing. They are a beautiful set of colours. 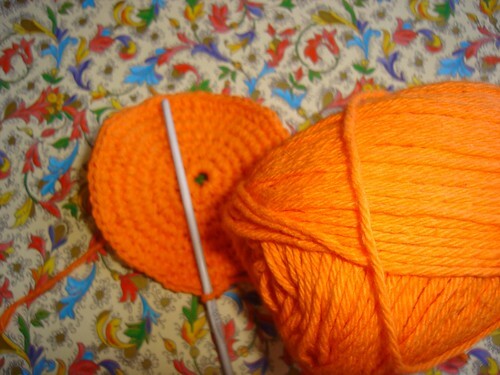 Since today is Monday it’s ‘Making for Araminta Day’ and I’ve started crocheting a sun hat for her with the orange yarn from The Secret Knitter. No pictures since it’s only got 4 rounds so far. Well, folks my computer time is over as I can hear the child awakening. Have a great day, and thanks for stopping by. Oh yes, I should just mention I won a contest at Syko – an angel fairy, how cool is that! Thank you! I’m really looking forward to seeing the package arriving. Doing the happy dance!! My friend Kerin is having a birthday tomorrow (27th) – it’s a big one. I can’t be there to hold a party for her in person, so I’m wondering if my bloggy friends will help me throw her a virtual one? On Wednesday I had the scariest moment of my life. Worse than falling 13.5 metres (~40 feet) off a rope ladder while climbing out of a cave when I was 16 or being in a single vehicle accident and writing off a car at 26. We decided to make another attempt at Table Mountain. We called in advance to make sure that the cable car was running and drove into Cape Town. The Cable car got a third of the way up the mountain and then, after some muttering into his walkie talkie the driver reversed back down. We sat at the bottom for a few minutes and then the car once again went up the mountain. Just as we docked at the top an announcement came over the loudspeakers that the mountain was closed due to strong winds, but they let us out. We emerged into cloud skidding across the ground – we were walking through the clouds and howling wind. After about 2 minutes I took Gorgeous Girl and was hurrying to get her out of the mist. Somehow, I lost my footing and pitched forward. Because I was holding the child I couldn’t break my fall and my knees took the full impact, as I continued to fall forwards I threw myself to the side in an attempt to avoid landing on top of Gorgeous Girl. After a fairly decent commadno roll I ended up flat on my back, with Gorgeous Girl screaming hysterically clutched to my chest. People came running from everywhere and were trying to help me up and pry Gorgeous Girl out of my hands. My brother who saw me fall and is quick on the up-take realised that I wouldn’t give the child to anyone except Gorgeous Man so he called him over. The child was whisked inside and I was helped to my feet. The cable car staff put us on the car first and found me a place to sit near the ‘driver’, then they packed the car with all of the people still on the mountain and took us down. Gorgeous Girl was fine, she spent the trip ‘chatting’ with a lovely Xhosa lady who tried to teach her how to say hello in Xhosa. I, on the other hand was a wreck. Damage to me is two skinned knees, two bruised knees, one quite spectacular bruise extending from the knee to the shin, one sore elbow and a good dose of stress dermatitis spreading across my left hand, wrist and arm. My Mum loves her Bible. She’s had it since 1968 and it’s been underlined, coloured, and written in. 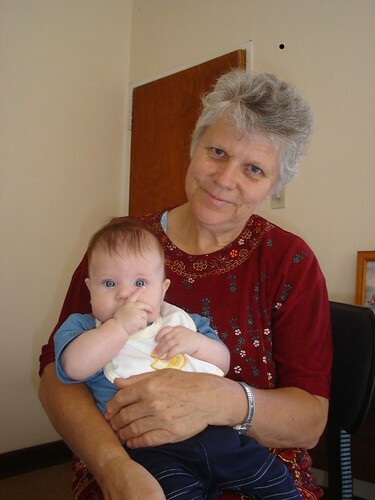 There are notes from sermons she’s liked, and photos of people important to her glued into it. But it is really looking its age. 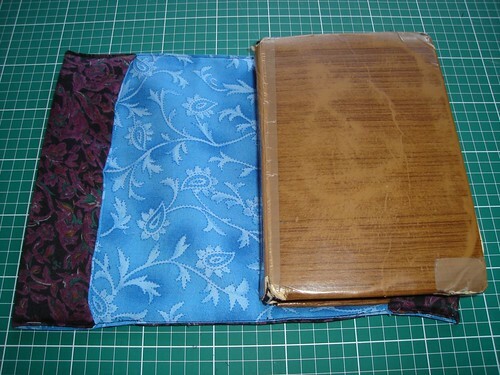 It’s had several covers in its lifetime and I decided it was time for a new one. We went through my stash and found this vintage jersey that she liked and I made this. It’s not great, but I’m pretty pleased with it given that it’s my first attempt at anything like this and I made it up as I went along. Mum isn’t at all crafty and on the right you can see her previous repair job. 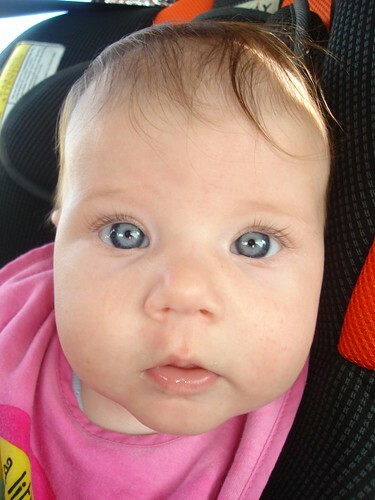 My mother and brother took the Red Bus around Cape Town today and Gorgeous Girl and I went to Baby Show and Tell. The woman who held the birth education classes for us hosts a morning tea once all the babies have been born. Here’s the ones that were able to make it. I also have my first charity finish for 2008. I didn’t meet my goal of 25 Things for Charity last year, getting pregnant and having a baby kind of messed with that, so it feels good to have the first one for the year done. I still need to weave the ends in, but they will be dropped off with some of Gorgeous Girl’s clothes on Thursday. Well my mother and brother arrived safely, and goodies from home were provided 🙂 Gorgeous Girl has morphed into perfect baby and is doing us proud. 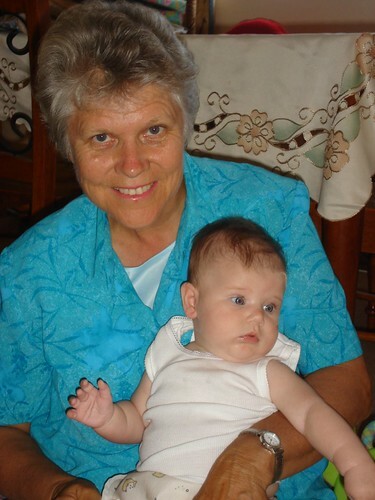 Here she is enjoying a cuddle with Grandma. before Gorgeous Girl decided that she was starving and I had to return to the car with a screaming child. After the feed I decided to play around with the camera. This was the best shot. 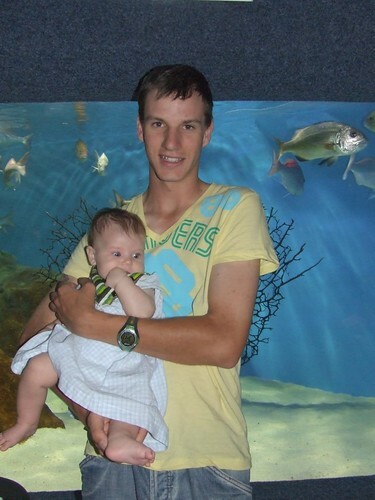 Today was also a busy day, we visited the Two Oceans Aquarium. 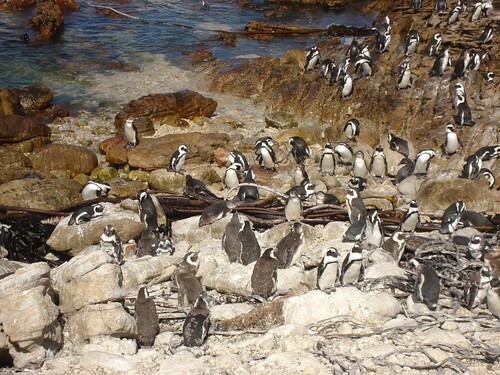 If you are ever in Cape Town it’s really worth a visit. Here’s Gorgeous Girl with her uncle. (wind so strong we could hardly open the car doors) the cable car was closed for the afternoon and we’ll need to try again another day. 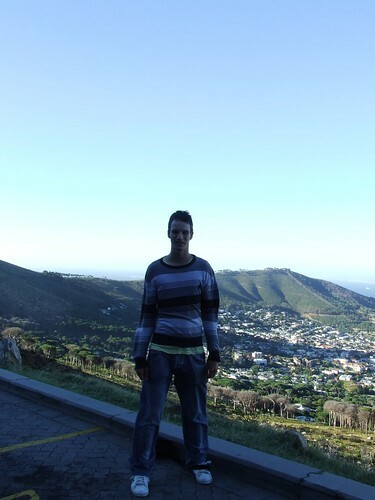 So we then drove around to Signal Hill which has a great view of the city and the ocean across to Robben Island. 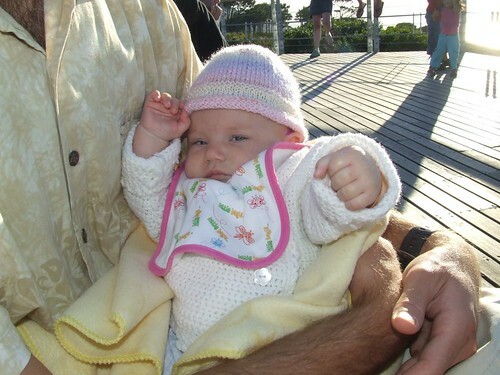 Gorgeous Girl decided that she was a kung fu baby. I’ve been knitting on the second baby sock for the local public hospital on the car drives and it’s nearly finished, so pictures soon. I’m also managing to sneak in a little hand quilting. I’m quite keen to get the African Animals quilt finished since Mum played courier for me and brought over a very cool quilt kit I ordered and I’m keen to start it. I should also mention here that I won a competition on Kate’s blog, some very cool Christmas themed log cabin blocks and they arrived this week. Thank you Kate. I feel very lucky. Sorry no pictures at the moment. I know, I’m a bad blogger.